Fire Captian Tedmund Hall and Specialist Arnoldo Quinones. Station Fire LODD Update: IC / PIO Station Fire announced that 2 LACo Firefighters are LODD as a result of the vehicle they were in going over a cliff. It has been reported the Firefighters were fleeing LACFD Camp #16 on Mt. Gleason as it was being over-run by extreme fire behavior. Four injuries have been reported. Hall and Quinones worked at the remote prison Camp 16 supervising inmates trained in wilderness protection. State corrections officials said it appeared the two firefighters may have died while searching for an escape route for three corrections workers, other fire personnel and 55 inmates who rode out the fire inside the camp's dining hall as flames fiercly approached the area. Hall and Quinones were repositioning their truck on the small path near the camp when for some unknown reason it plunged some 800 feet over the side of the road into a canyon. It's believed the truck may have been overrun by fire prior to the accident. Latest Inciweb media release: Sunday, August 30, 2009 @ 11:00 p.m. 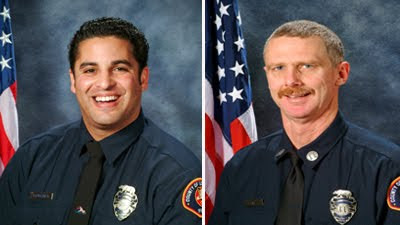 It is with our deepest regret to inform you of the Line Of Duty Deaths for Fire Captain Tedmund "Ted" Hall and Firefighter Specialist Arnaldo "Arnie" Quinones. These two members tragically lost their lives when the where overran by a fast moving fire which approached Fire Camp 16 on the "Station Fire" Incident. Fire Captain Tedmund "Ted" Hall was 47 years of age and was a member of the Los Angeles County Fire Department for 26 years and lived in San Bernardino County, California. Firefighter Specialist Arnaldo "Arnie" Quinones was 35 years of Age, and was a member of the Los Angeles County Fire department for 8 years and lived in Palmdale, California. For additional information, please contact Captain Mike Brown, Public Information Officer at (323) 881-2413. My heart and prayers go out to their families. My condolences go out to the family, friends and coworkers of these fallen heroes. A very good friend of Ted Hall that worked with him when he entered service at Fire Prevention. A great guy and a great loss. My best to his family, wife and boys. Wish I could attend his services. My condolences to their family. I've known Ted personally for over 26 yrs, as well as worked along side of him. He was a good man! Loving, kind, sweet, gentle, shy, he sacrificially gave his life for his Inmate Crew. My heart grieves and is heavy with sadness. =( I love and miss you Ted! My heart goes out to Katherine and your two sons.